cysts and found clear and without remarks, on January 2, 2008. Mirva is my beloved friend and performance horse who also has become a broodmare. Mirva has taught me so much about horses in general and Arabians in particular. She's a challenging companion! It's never boring spending time with her, how blue I ever might feel she always tricks me to a smile - she has a great sense of humour! I set my eyes on Mirva the first time when she was only one day old. She was an adorable black filly with a white blaze. I knew her mother Minerva and her older sister Mirkhana was "the best horse in the world" to me at the time. 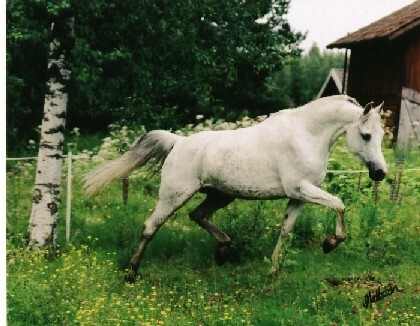 This was back in 1989 at Slängsboda Arabian Stud. Almost four years later I was fortunate to be able to purchase her. She's the horse of my dreams and I treasure every day we have together. We show in several Western events such as Western Horsemanship, Reining, Western Riding and Versatile Horse. She loves the Reining since it makes her feel strong and brave and she gets to show off her great sliding stops! I enjoy Reining too, but is now focusing on Western Riding and Versatile Horse. Mirva is also shown at halter with good results. At the 2005 International C-show in Kumla she was class winner with 90,33 points and became Reserve Champion Mare! At the Swedish Nationals the same year she got gold medal points and a third placing in tough competition. She was also awarded a silver medal in Western Horsemanship at the Riksmästerskap in Western events for Arabians. She's a perfect combination of beauty and performance! In the year 2000 Mirva gave birth to a wonderful daughter, Maiyah (by Fynd). Maiyah was Class I at "fölmönstring" in 2001. I sold her as a weanling to Maria Uhlin Norrgård in Västerås, but in 2004 Maria had to sell Maiyah and I helped her to find a new good home. Maiyah is now owned by Elin Möller-Norén and live in Vallentuna, north of Stockholm. Mirva is presently standing at my friend's farm in Gimo, Uppsala.